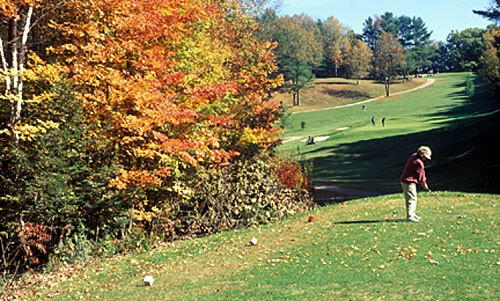 A visit to Southwest New Hampshire should include stopping by one of our many golf courses. The Monadnock Region boasts seven courses, all offering spectacular views and plenty of challenge. Angus Lea Golf Course, 126 West Main Street, Hillsborough, NH 03244. (603) 464-5404. Bretwood Golf Course, 365 East Surry Road, Keene, NH 03431. (603) 352-7626. Crotched Mountain Resort, 740 2nd NH Turnpike North, Francestown, NH 03043. (866) 729-7182. Keene Country Club, 755 West Hill Road, Keene, NH 03431. (603) 352-0135. The Shattuck Golf Club, 53 Dublin Road, Jaffrey, NH 03452. (603) 532-4300. The Shattuck is one of the most visually stunning golf courses you'll ever play, with 18 championship holes carved from the granite foothills of Mt. Monadnock. GPS (Global Positioning System) and yardage guides now available. Amenities include driving range, pro shop, Mountain View Grille and Cathedral Ballroom.